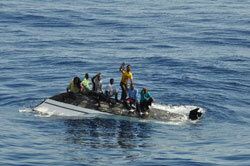 Seven suspected migrants atop a 24-foot capsized vessel 75 miles northeast of West Palm Beach, Fla., Feb. 6, 2014. The seven were discovered and rescued by the Royal Netherlands Navy vessel Zeeland. Photo by Royal Netherlands Navy. Coast Guardsmen at Coast Guard Station Miami Beach, Fla., transfer the bodies of suspected migrants found 75 miles northeast of West Palm Beach, Fla., Feb. 6, 2014. The bodies were located inside the hull of an overturned 24-foot center console vessel. U.S. Coast Guard photo by Petty Officer 2nd Class Sabrina Laberdesque. MIAMI — A fourth person has been confirmed dead following a capsizing 75 miles northeast of West Palm Beach, Fla., Thursday, and today the Coast Guard is warning about the dangers of illegal maritime migration. On February 6, 2014, four people died in a suspected smuggling venture when their 24-foot boat capsized 75 miles northeast of West Palm Beach, Fla. Seven people were rescued; three of which were Haitian nationals, three were Indian nationals and one was a Bahamian national. The Coast Guard continues to aggressively discourage the people of Haiti and other Caribbean nations making dangerous and deadly voyages at sea to get to the U.S. “Do Not Take to the Sea” has been a persistent message of the Coast Guard Seventh District that focuses on deterring and dissuading Haitians from using dangerous smuggling networks. The Coast Guard Seventh District partnered with local leaders from the South Florida Haitian community and launched a Public Service Announcement in December 2013 asking Haitians to stay home rather than risk a perilous voyage at sea. "We know of the ones we interdict at sea, we often know of those who may make it to land, what we don't know are the many hundreds who have perished at sea," said, Capt. Brendan McPherson, chief of response, Coast Guard Seventh District. This is the second deadly incident involving migrants in the past 12 days. On Jan. 30, one Haitian migrant was reportedly found deceased while coming ashore off Ft. Lauderdale Beach, Fla. 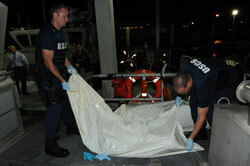 The Coast Guard continues to stress the importance of safe and legal migration to the U.S.